Beautiful Waterfront Lodge Sleeps 12 with Lake Views & Near Yosemite! Lakefront home with private dock in popular Lake Shore Park that offers Private beach, Launch ramp, Picnic area, Horseshoe pits, Bathroom facilities, Trailer parking, and Forested Walking Trails! Property backs to forestry land, with seasonal stream, lake and forest views. Remodeled home with a total of 5 bedrooms and 3 baths. Open floor plan with vaulted ceiling, and lots of windows for natural lighting. 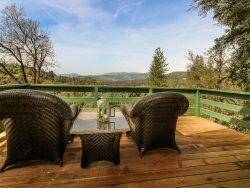 Fabulous deck off the living area offers 800+- of outdoor space with a custom made dining table that seats 14! Main level offers 2 bedrooms with cal. king, 1 bath, living room, dining area and kitchen, upper level offers a family suite with built in captain beds, and queen bed plus a full private bath. Lower level has 2 bedrooms both with sliders leading to back yard and lake, a full bath, a bonus family room and laundry area. . Private boat dock and lots of trails to walk through the forest to the lake.